Now, I have searched every variation of Stewart and William H Stewart to find any scrap of information in the newspapers online, even searching his known alias of “Thomas” (which I’ve never found the reasoning behind that name choice). I’ve searched in every town they lived in, in every county they or their parents lived in, and even searching in adjacent counties in the off-chance they spent time there as well in-between census dates and city directory entries. But as you know, they’re constantly updating newspapers online and adding more all the time and so when I returned to my Stewart research, I found this tiny snippet from August 25, 1904, in The Times Recorder newspaper in Zanesville, Ohio. From The Times Recorder (Zanesville, Ohio), 25 August 1904, pg 5, col 3. Click to view larger. While it might not seem staggering news for some, for me, it gave me a HUGE glimpse into their marriage ten years before their murder/suicide. Noting that this was the “third occasion” since their 1902 marriage (that was known), what more happened that wasn’t documented? I also find it boggling that she assaulted him first but yet he was the one charged and fined. It sounds like she got the worst of it as she still had marks, but weren’t women culpable of assault too? In a news article following their deaths, her brother Asbury gives an example of how Esther and William fought all the time about the silliest, smallest things including an argument over the placement of a knife in the kitchen to where they didn’t speak for two weeks following. Another article eluded to how they fought quite a bit and always made up quickly afterward. Asbury admitted his sister (and William, too) had a hot temper, and this article just confirms everything Asbury stated and more. They seemed to be ready to fight over every little thing. With this article now though, I somehow have shifted some of the blame towards Esther, too. I had always felt she was just a victim, but it looks now like she was an instigator and perpetrator, as well. While she doesn’t have a stone currently, I know where she’s buried, and I wonder how I will feel when I go back. Will I feel sympathy again, or perhaps something different knowing she was part of the mayhem and destruction that followed? Funny how your family’s narrative can change with just a newspaper snippet. 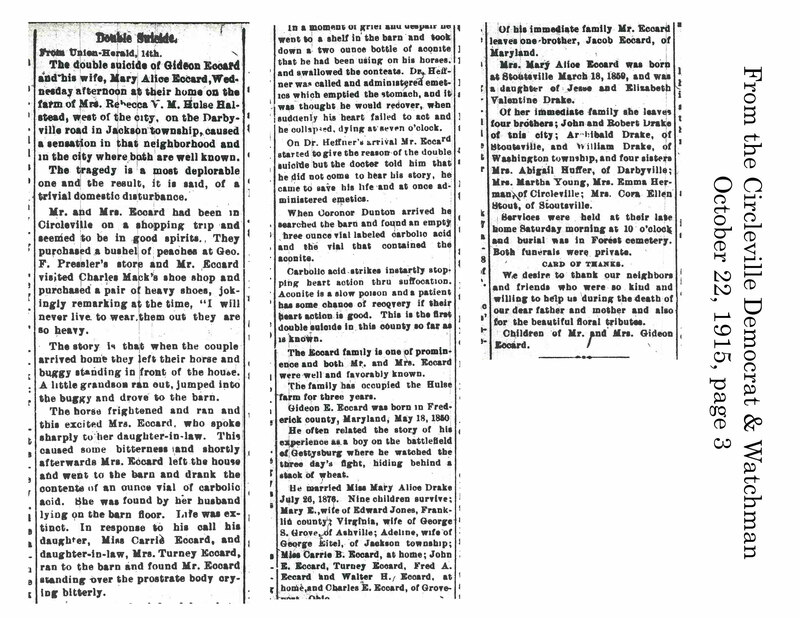 One of the more outrageous family stories I share with my genealogy students is the double suicide of my 3rd great-grandparents, the Eccards, in 1915. I had used their tragic deaths as a way to illustrate how to be prepared for finding sad and unexpected events in your family tree. But now, in light of new evidence, I can use them to illustrate how family lore can absolutely be wrong and why you need that paper trail to corroborate (or disprove) things you’ve been told. Such is the case with the Eccards. When I first found their death certificates in the process of doing my DAR application, I turned to my great Aunt Rosie, the Eccards’ great-granddaughter. If you’ve read me before, you might remember Aunt Rosie was also interested in genealogy until her death this past year, so I turned to her a lot with questions. So, when I asked her about the Eccards, she shared that her grandmother, Mary Elizabeth Eccard Jones, was very pregnant at the time so she wasn’t able to attend her parent’s funerals. She also said that she heard two theories about why they committed suicide – one was that they were swindled out of their farm by a sleazy lawyer and the other was that the wife, Mary Alice Drake Eccard, was terminally ill and her husband Gideon couldn’t bear to live without her and they had a “suicide pact” of sorts. In the newspapers online, I found just the tiniest mention of their double suicide. No details, no motives, and most notably, no obituaries. I didn’t find that out of place or abnormal really because it wouldn’t be the first time a family has opted not to publish an obituary. Given the grim circumstances surrounding their deaths, I understood maybe there just wasn’t one out there to be found and let it go at that. I had a small mention in the paper that corroborated their death certificates, so I was satisfied enough to move on. However, this past month, I’d been working on “bushing out” my tree branches on the Eccard line and while working on their daughter, Carrie Belle, I couldn’t find her obituary either. I was in the process of writing to the local library for Carrie Belle’s obituary and while typing the letter, I decided “Heck with it. I’m just going to ask them if they have the parents’ too.” Happily, the librarian got back to me very quickly! The librarian had found Carrie’s obituary and even provided me with the death certificates for her and both her parents. (I was appreciative, of course, but I already had those.) However, she sent me something so unexpected and amazing! It completely changed the story as my Aunt Rosie had told me. I feel like I hit the genealogy jackpot. She sent me the joint obituaries of Gideon and Mary Alice, along with an article about the circumstances of that day. The Eccard obituaries & sensational details into their deaths. To summarize the article (and you can click it to enlarge and read more), it appears that Gideon and his wife, Mary Alice, went out that day to town and picked up shoes and peaches. After they drove their horse and buggy home, a little grandson ran out of the house and startled the horse. Apparently, there were heated words exchanged between Mary Alice and her daughter-in-law. Shortly after their argument, Mary Alice went to the barn and drank a vial of carbolic acid and dropped dead. She was found by Gideon, who called out to his daughter Carrie Belle and the daughter-in-law, who came running to the barn. They found him crying, and in his grief, he ran over and drank a bottle of aconite. The doctor was called and when he arrived, Gideon was still able to talk and was trying to explain what had happened and why. The doctor administered medicine to make him vomit but unfortunately the poison ended up being too much, and he died anyway. In addition to having this demolish the stories of what my Aunt Rosie had told me, I was also left with a boatload of questions! I know Gideon was devastated so I get his grief was motivation for drinking aconite but what kinds of harsh and hurtful words were exchanged that day to cause Mary Alice to go and drink poison like that? That seems so rash of a response. I can only imagine that there was some other source of contention going on there as well. Maybe some long standing resentment or problems within the family circle? I’m also left with a puzzle. I had no idea that Gideon witnessed the events at Gettysburg but I’m oddly not sure how he did. His parents were both from Maryland and lived there their entire lives. I did not find any service records for Gideon nor his father Noah. Gideon’s grandfather Peter did serve in the War of 1812 but I think he was old at the start of the Civil War. Gideon was there in Maryland all his life, still in 1870 even, years after the war and then suddenly, he pops into Ohio by 1880. So how would he have seen Gettysburg? Where does that fit in? Accompanied uncles maybe? I have yet to branch up and out that that far yet. It’s an interesting detail for later research to be sure. I’m truly happy though now. I have a new way to talk about the Eccards in my teaching aside from using them as examples of what sad things can possibly crop up. Now I can talk about them in regard to disregarding assumptions, continually looking for that paper trail, and how you still REALLY do need to do some old-fashioned letter writing to find things that aren’t online. I stress it enough to them already, but now I have an even better example to show them of why you still have to do offline legwork as well. I haven’t written very much yet about my husband’s family but this story is pretty interesting for us so I wanted to share. My husband’s grandmother Barb had heard a very long time that her grandfather had died during World War I but she didn’t know the specific circumstances other than he probably died on the boat over to Europe. So when I began researching her side of the tree, I kept that in the back of my mind when looking at the life and death of Daniel Goodwin Durbin. Early on, I found this un-cited clipping from somewhere/someone that told Daniel’s tale. 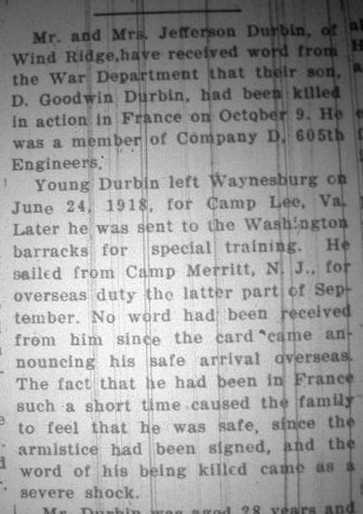 It was reported in this clipping that Daniel left 24 June 1918 to Camp Lee, Virginia, and the Washington barracks for training. Then it says that he sailed from Camp Merritt, New Jersey, for overseas duties in late September 1918. It says that the family received a card announcing his “safe arrival” overseas but nothing had been heard since. 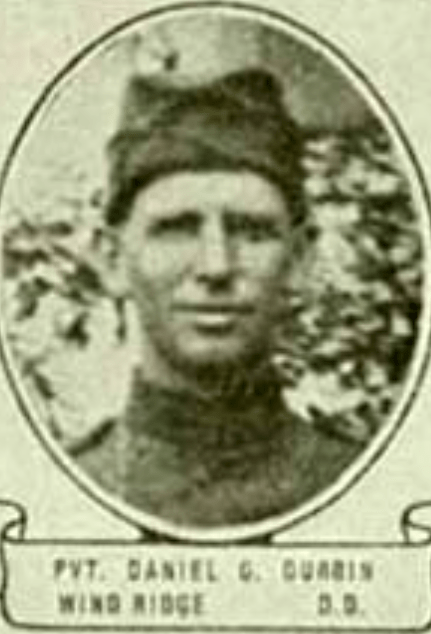 It also talks about the armistice being signed and that news of his being “killed in action” came as a “severe shock.” The news article also says that he married Edith Curry earlier in the year (who is now with her parents) and is survived by his parents, two brothers, and two sisters. No mention of his infant daughter, Marguerite. This is the results of my research into Daniel’s life and death which serves to disprove several of the statements made in that initial clipping I found. Daniel was born 31 May 1890 in Greene County, Pennsylvania, to Jefferson Davis Durbin & his wife Luanna “Annie” Supler. I recently verified through Greene County, PA, that Daniel married Edith Curry (1899-1925) on the 10th of June 1918 in Waynesburg. The story Grandma Barb was told, was that Daniel only saw his daughter, Marguerite once before he shipped out. But that couldn’t be since Marguerite was born 27 May 1918, they married on the 10th of June (so the baby had already arrived), and he didn’t leave for Camp Lee until the 24th of June. He shipped out for France on the 25th of September as we’ll see below. That’s plenty of time for him to see his daughter more than just once. The news article reports Daniel leaving out of Camp Merritt, New Jersey, to head overseas. That’s misleading in a way. Soldiers at Camp Merritt traditionally boarded ferries and went to Hoboken to ship out but for whatever reason, Daniel can be found on an outbound military passenger list on the 25th of September 1918 in New York on the ship Teucer in route to Liverpool with the 605th Engineers, Second Battalion, Company D. Little did he know that would be the last time he’d see American shores with his own eyes. The item I can’t resolve is the card received saying he arrived safely. He couldn’t have sent it since he died a day after docking. Was it an automated thing sent by the government to quell worrisome families at home? Another item of curious note is that the armistice was signed November 11, 1918, which was after his death… so why would the author of that original clipping write that? Here’s where it gets more interesting… his granddaughter Barb assumed his body was sent immediately home for burial as he IS interred at the Jacksonville Cemetery in Wind Ridge, Greene County, Pennsylvania. But, what she didn’t realize was that he was FIRST buried in the Everton Cemetery along with others who had perished in the hospital at Liverpool. During World War I, “almost 700 American servicemen died in Liverpool’s military hospitals and most of them were buried in Everton cemetery.” In 1920, their remains were removed to the Brookwood American Cemetery and Memorial in Surrey. One year and 9 months later after his death, Daniel’s name appears on a passenger manifest of “Military Deceased” on the ship Antigone leaving Liverpool on the 26th of July in 1920. (The notation at the top of this passenger list shows these remains came from the Everton cemetery.) 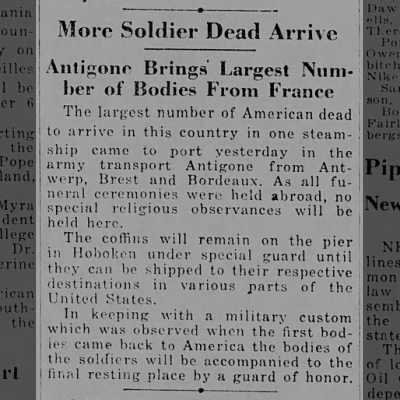 The Antigone was carrying nearly 1600 bodies home – the largest shipment of soldier’s bodies being returned to America. It made the papers everywhere when it docked on August 7th in Hoboken, New Jersey. On August 15th, Daniel’s family was notified that his body was on its way home. His widow Edith would remarry in November 1920 shortly after his burial. Sadly, she would die in 1925 from preeclampsia complications during a pregnancy, leaving her and Daniel’s seven-year-old daughter Marguerite to be cared for by her Curry grandparents. 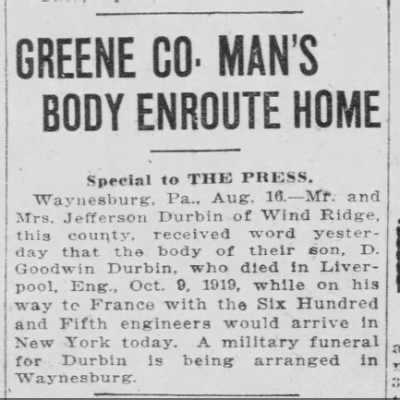 Daniel Durbin and other Greene County men who died in World War 1 are commemorated on the Rain Day Boys Project and you can read more about them by clicking here. There will be a memorial dedication to them on November 11th at 11 am in Waynesburg, PA. Ever have that one relative whose story that you just can’t get out of your mind? I have several of those relatives like that but one that stands out for me is my 4th great aunt, Emma Drake Leist Herman. February of last year, I wrote about what I knew of her story which included the suicide of her last husband, Henry Herman, who drank carbolic acid they morning after they had a fight. As incredible as that tidbit was, Emma’s story continued to be fascinating as her death certificate revealed she died at 8 pm on 2 June 1916 at age 39 from shock with a contributory cause as lightning. What was she doing outside in a storm at 8 pm? Color me fascinated! April 25 – Genealogy Club @ the Moffat Library featuring using Find a Grave with Colleen M.
May 30- Genealogy Club @ the Moffat Library featuring Family Narrative Writing with Danielle D.
August 29 – Genealogy Club @ the Moffat Library featuring File Storage & Security with Harvey B. © 2019 Jill Moore & The Serendipity Tree. All rights reserved.